Now that Shogun 2: Total War is on the Steam workshop, we’ve picked out the ten best user made maps available. There are some gorgeous battlefields, spectacular castles and a surprise trip to Egypt. If you fancy a more extensive gameplay overhaul, check out our list of Total War: Shogun 2 mods. Total War modders love Lord of the Rings, so it comes as no surprise that the highest rated map on the steam workshop is a recreation of the battle of Helm’s Deep. There’s something oddly wonderful about seeing the iconic fortress recreated in Shogun 2’s distinctly Japanese style. Even non Tolkien fans will enjoy fighting from an such an incredibly well-fortified position. Helm’s Deep offers such protection to its defenders that the creator recommends playing a single defender against three attackers, just to give the besiegers a fighting chance. While some maps on this list are here because of interesting constructions or new tactical possibilities, Flower Valley is here because it’s pretty. Modder Noizzzmaker is clearly a huge fan of Shogun’s wildflowers, and he’s constructed a gorgeous map built around them. Every inch of the valley is covered in flowers, the whole thing looks like something out of a Japanese watercolour. One of the great benefits of Shogun’s new player made maps is that they aren’t forced to stay within the borders of Japan. 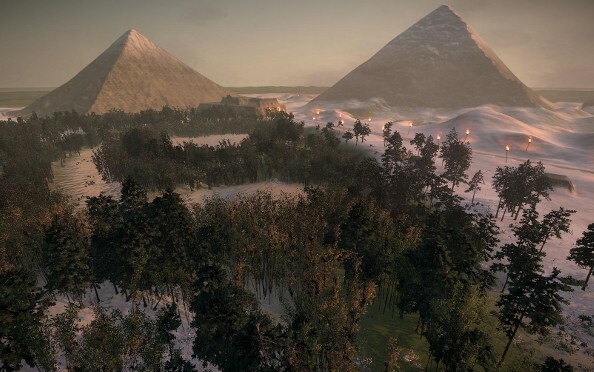 Here, modder Taharqa offers up a change of pace by switching the action to Cairo. The desert map offers a refreshingly different look from Shogun’s standard fare, and the pyramids in the background look utterly spectacular. The attempt to recreate Cleopatra’s Needle using generic rock textures is less impressive, but I can forgive occasional clunkiness in the name of much needed variety. Another interesting high concept map from Taharqa. This one constructs an enormous, elaborate city that dominates the map. Buildings cover the terrain, many of them garrisonable, with little mini-forts to capture along the way. The result is a very different kind of battle, one reliant on tight quarters street fighting rather than grand cavalry charges. 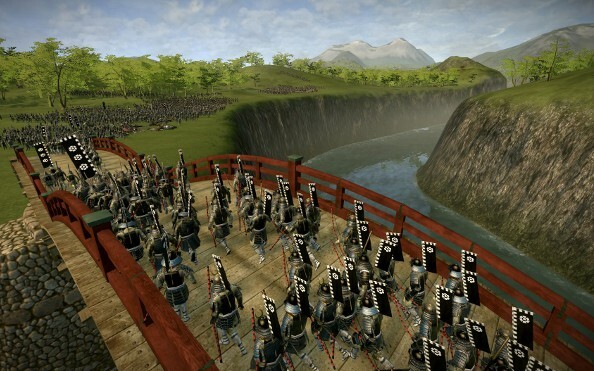 Castle Town is a very clever spin on Shogun 2’s siege battles. The fortress is designed with several layers of defences, and the defender is expected to fall back as each one crumbles. At each stage, the enemy must squeeze through tiny gates and across narrow bridges while your archers rain death upon them from the high ground. Iwo Jima became famous during World War 2, when the US suffered heavy losses taking the tiny island. This map offers you the chance to do attempt the same assault in the Shogun era. Even without the interesting historical context Iwo Jima is a unique and interesting map. Attackers begin waist deep in water, wading their way onto the beach before attacking the island proper, making for a dramatic battle. River Gorge is dominated by a huge canyon that winds its way through the entire map. Two narrow bridges are the only way to cross the gorge, forcing melee troops into a giant meat grinder if they want to advance, while archers pepper them with arrows from the nearby banks. While Castle Town is clever and elaborate, Behemoth is just huge. The enormous castle squats directly in front of the attacking army, which has little choice but to charge directly uphill in a suicidal frontal assault. It isn’t subtle or clever, but it is an epic and brutal battle, where massive casualties are inevitable. Shogun straddles a wide period of history, from the early days of feudal Japan to the beginnings of industrialisation, and it’s nice to see a map that’s set in the more modern side. End of the Line takes place in a small railway town, surrounded by tracks. The industrial backdrop feels very different from more feudal maps. River Village is one of the most picturesque user maps available. It’s set in a lovely little fishing village nestled amongst the cherry blossoms, so of course you have to sack it and burn it to the ground. There’s two distinct phases to the battle. The twin bridges into the town provide a narrow choke point that must be defended, but if the attacker makes it across things spill out into a chaotic urban battle, requiring very different tactics.